Here in Tbilisi, we’re preparing for mayoral elections in October. The race will be heated, but can the role actually change anything for the better? 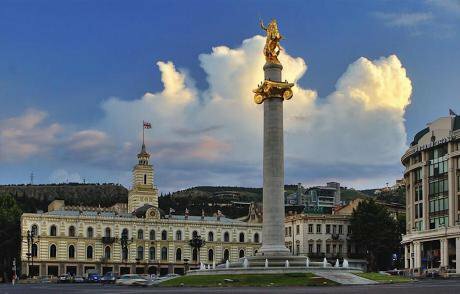 Tbilisi’s City Hall, completed 1878, stands on Liberty Square, behind a monument to St George. Photo CC-by-SA-2.0: George Kvizhinadze / Wikimedia Commons. Some rights reserved. Amid heated discussions about new constitutional reforms initiated by the ruling Georgian Dream government, Georgia is gearing up for local elections this October. The contest is likely to be a fight for survival for the remnants of the United National Movement (UNM), the former ruling party of Mikheil Saakashvili, which split in two at the start of this year. Some eleven regional district and city heads are to be elected, but the greatest prize will be Tbilisi, Georgia’s capital and largest economic hub. The talk in Tbilisi is all about the candidates for the city’s next mayor, and what their priorities will be in governing the city (elections for the Sakrebulo, or City Assembly, will also be held in parallel). But for all this excitement, our society hasn’t paid a lot of attention to the political significance of mayor’s role and what powers it has to change anything. What, then, is the measure of a mayor in Georgia today? Tbilisi’s mayoralty is no stranger to controversy. Tbilisi’s current mayor, Georgian Dream’s Davit Narmania, won his post in August 2014 in a runoff vote against UNM candidate Nika Melia. The contest was marred by the controversial arrest in July 2015 of long-time mayor Gigi Ugulava, a close Saakashvili ally who came to power in 2006 (Ugulava was re-elected in Tbilisi’s first ever direct elections for mayor in 2010). Georgian Dream, brainchild of the billionaire Bidzina Ivanishvili, had come to power in 2012 on a platform of “restoring justice” after the excesses of the late Saakashvili era. The 14-month pre-trial of mayor Ugulava, which Georgia’s Constitutional Court ruled as illegal, became a symbol of the ruling party’s fervour in settling old scores with the now-stateless Saakashvili and the party he once led, the UNM. Ivanishvili’s campaign to expel UNM as a political force from Georgian public life continues to this day, and the mayoral showdown is just one front. While the candidates’ pre-electoral programmes haven’t been fully released, their public statements would have given us a pretty good idea of what little they appear to stand for. Elene Khoshtaria is candidate for the European Georgia party which split from Saakashvili’s UNM, and its principle polemicist in public life. While Khoshtaria’s strived to present herself as a new face in politics, she was once deputy state minister of Euro-Atlantic integration in Saakashvili’s government. Khoshtaria is known for her association with close Saakashvili associate Giga Bokeria, who enjoys a poor reputation in much of Georgian society, and for her founding of GRASS (Georgia’s Reforms Associates), a Tbilisi-based think-tank which has strongly opposed Georgian Dream. These associations will not work to her advantage; she has few chances to win in this race. Facing Khoshtaria is Zaal Udumashvili, a member of the “loyalist” UNM. Udumashvili is a former news anchor at the Rustavi-2 TV station. In March 2017, a scandal erupted after Georgia’s Supreme Court handed ownership of Rustavi-2 businessman Kibar Khalvashi, who owned the channel from 2004 to 2006. The move was seen by several international and local rights groups as political, given Rustavi-2’s critical stance towards the Georgian Dream government. Among the government’s diehard supporters, Rustavi-2 is seen as a pro-Saakashvili propaganda outlet. Udumashvili cuts a peculiar figure — despite this backstory, he could be perceived as a “non-political” candidate due to his background in media. With his nomination, UNM is attempting to mobilise support among voters sceptical of more traditional politicians, of whom there is no shortage in Georgia today. The favourite? Ruling party Georgian Dream has nominated Kakha Kaladze, former minister of energy, as its candidate for mayor of Tbilisi. Photo (c): Alexander Imedashvili / RIA Novosti. All rights reserved. 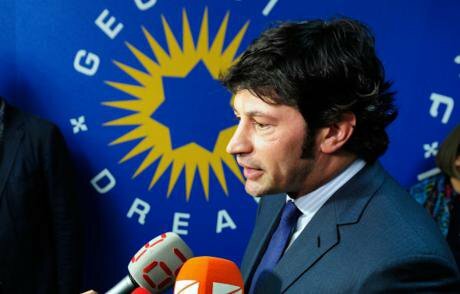 The confrontation between Khoshtaria and Udumashvili will easily divide the opposition vote to the advantage of former minister of energy and former football player Kakha Kaladze. As Georgian Dream’s candidate for mayor, Kaladze is an influential figure within the party, with many powerful allies. The Georgian Dream candidate has also pledged to end “urban genocide” and continue Narmania’s pledges to tear down some of the capital’s Soviet-era housing stock. His reputation has been tarnished by conflicts of interest during his time in office, but that may not matter — Kaladze will be able to mobilise administrative resources and powerful financial backers to have a real shot of winning this race. A recent poll by NDI found that a staggering 68% of Georgians don’t actually have a political preference in these upcoming elections. Among those who were sure they’d cast a vote, Kaladze came first with 37%. Their next favourite, with 20%, was independent candidate Aleksandre Elisashvili. A quasi-charismatic activist with plenty of experience in protests, Elisashvili is mostly endorsed by NGOs and civil society actors from among the urban elite. While he lends a voice to the rudderless sense of anger and disillusionment on Georgia’s streets, it’s hard to discern what his political programme would actually entail. Furthermore, in the shock event of his victory, Elisashvili would find it difficult to cooperate with Tbilisi’s City Assembly, where Georgian Dream will supposedly still enjoy a majority. With this lineup in mind, let’s return to my initial question. In modern European societies, a mayor is perceived less as an entrepreneur or a manager and more as a politician, a statesperson with a distinct vision, a philosophy and a strategy for the development of the city. In some cases, the legitimacy and political convictions of the mayor are so strong that often they can afford severe confrontations with the central government. Clearly, this kind of legitimacy and strong political influences are conditioned by high levels of local democracy in some western European societies where the mayor is primarily accountable to the voters rather than the central bureaucratic apparatus. In many democratic societies, mayors can even go on to become head of state or government. More remarkably, from a Georgian perspective, a mayor can also become a member of an opposition — something that is practically impossible to come across in post-Soviet countries, where the mayor is a member of the ruling political party and acts as a manager for its behalf, rather than a local politician with a civic vision. We had some troublemakers, too. Benia Chkhikvishvili, mayor during Georgia’s brief period of independence, had led a peasant revolt in Guria, on the shores of the Black Sea, in 1905. He returned to Georgia in 1924 to lead an uprising against the Bolsheviks, who eventually caught and executed him and his comrades. In Soviet Georgia, Tbilisi was ruled by the head of the so-called city council executive committee. The Soviet-era counterparts of today’s mayors were functionaries who served merely to implement development plans drafted by the republic’s elites — mostly aimed at further urbanising the growing city. Of course, socialist-era mayors were not accountable to capital, but neither were they accountable to Tbilisi’s inhabitants. As for post-Soviet Georgia, the mayor’s institution was introduced to the Georgian political life as a part of the European tradition of local administrative and political government. These days, Tbilisi’s mayor is perceived in two dimensions. First, a mayor is a party functionary, and to it he owes his legitimacy. While this is a facet of many mature local democracies, the problem is that in post-Soviet Georgia, mayors usually fail identify themselves with the voters and fail to understand problems in a local context. Thus, for most of them, their work and their judgments depend on strategies concentrated in the central government and ruling political elite. Georgians’ well-ripened scepticism and nihilism towards governors and mayors is such that citizens are more inclined to solve their problems by communicating directly with central government. Another dimension is that a mayor is increasingly perceived as a large-scale entrepreneur or manager rather than a politician or statesperson. At first glance, this may not be problematic, but the fact of the matter is that a mayor cannot be a good entrepreneur without primarily being a statesperson. A managerial, rather than political, mayor is inclined to using practices and mechanisms that were already in place. A useful example would be the failure of mayor Davit Narmania to change the institutional practices by his predecessor, maintaining the same relationship to business interests in a changing environment with evolving residents’ needs. It seems as though Tbilisi has become a kind of corporation where managers promoting the interests of the shareholders (such as big business and the construction sector) come and go. A mayor as politician or statesperson is a cardinally different figure, who tries to take newly systemic approaches and strategies for the good of the city — focusing on the interests of public goods rather than private capital. Ideally, such a mayor takes a holistic approach to local problems, and can encourage the direct political participation of its citizens. 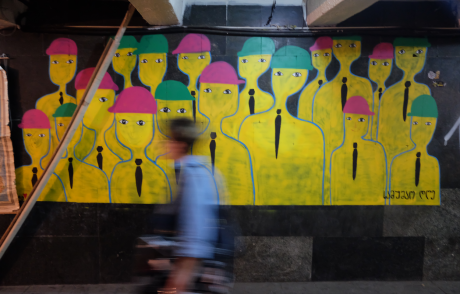 A crowd in a central Tbilisi underpass, 2017. Photo (c): Maxim Edwards. All rights reserved. Tbilisi’s city council is preparing to draft a general plan for urban development, and resentment is on the rise at lavish and controversial construction projects of questionable civic value. Only a political mayor can approach urban development in a political sense, fulfilling their obligations to the city’s residents as a social constituency. A managerial mayor merely adjusts the dynamics of urban development to the fleeting interests of investors, often to the disadvantage of local citizens. It is certainly possible for a political mayor to be ineffective, but here we are talking about general experience and general practices of European local government — practices which Georgian local government has never meaningfully implemented. Perhaps this is a bigger malaise. Post-Soviet Georgia appears to lack a fundamental understanding of the political. While it may be the substance and style of our daily lives, politics is just understood as a dirty game. In Athenian democracy, those who didn’t want to actively participate in the political life were seen as disregarding society’s needs, bothered only by their narrow interests. In western European schools of thought, politics is not understood as a dirty game exclusively for professional politicians, but a sphere of public action where citizens and politicians defend common interests in an organised manner. Across Europe, the “anti-political” and the “non-political” has reared its head, to the advantage of managerial neoliberals and right-populists alike. In that sense, perhaps we’re ahead of the curve — in Georgia, the stigmatisation of politics may as well be a tradition of our post-Soviet identity. The choices on offer this October are not appetising. By distancing themselves from politics, these politicians undermine the very fundamentals of a civic state, instead presenting themselves as competent managers. The rest assume the mantle of “anti-political” everymen, an act of resistance which does little to resolve a crisis of democratic legitimacy — a crisis which not only Georgia suffers. The mayor of our capital can also be understood in this manner — where taking care of the city is seen as an act of corporate management, not a task of the state. This is a true obstacle for the development of the city as a political, social, economic and cultural space – one which we need to reclaim for politics. A version of this article originally appeared on the blog of the Georgian Public Broadcaster as “City mayors and their political values.” It was translated from Georgian by Giorgi Kobakhidze and expanded by the author for openDemocracy.